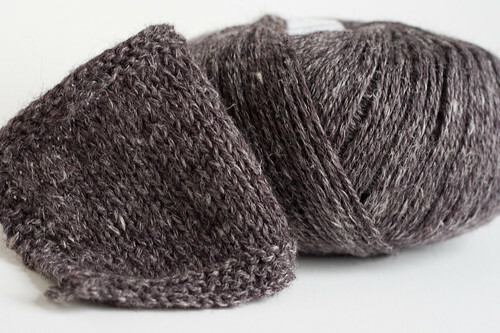 splityarn: holy smokes! a post about knitting! holy smokes! a post about knitting! 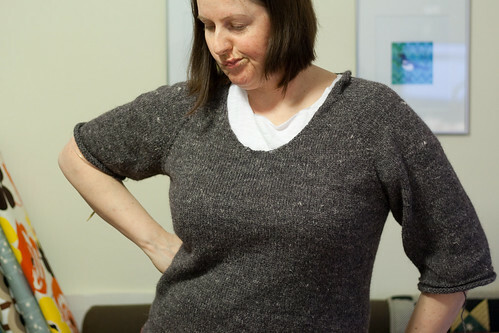 Back in November, Minty cast on and knit an amazing sweater in under two weeks. (It's gorge, you have to go look.) When I saw how quickly it was all coming together, I thought to myself, hey! I can do that. And I could do it, I'm pretty sure, but like a lot of things I plan to do, I didn't. I came really close though. I'd been wearing Husband Sweater #2 in my office for a few weeks and decided that I needed my own sweater to work in. It needed to be a little more feminine, with less than the 10 inches of ease that the Husband sweater has on me. I was thinking top-down raglan, three quarter length sleeves, deep scoop neck (I have that pullover-strangulation fear thing) and turned hems. Easy. I ran into Woolcott in Harvard Square and bought the last 4 balls of Hempwol (35% hemp, 65% wool) they had in Italian Plum. I swatched, measured, cast on and knit like the wind. After a week, I had most of the body finished. 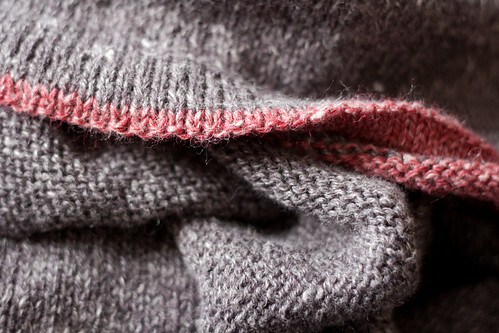 Knit the body and bind off. Needs more waist shaping. Rip back and add more increases to offset womanly curves. Finish the body and bind off. Knit first sleeve and bind off. 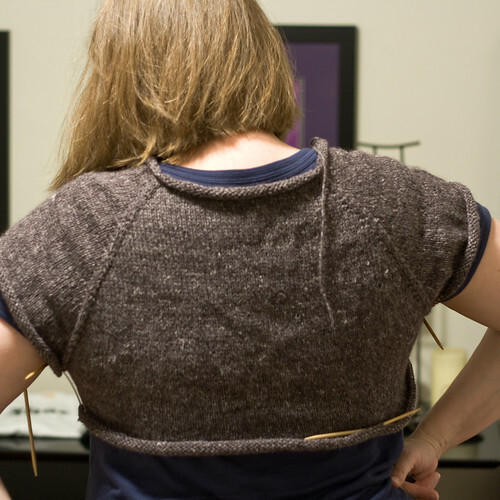 Begin second sleeve and knit to two inches before bind off, run out of yarn. Reknit first sleeve with less ease. Pretty! Run to Woolcott to procure more yarn. Swear. Buy pink Hempwol instead. Swear more when ripping of sleeve and body becomes necessary to add in pink hems. Rip a few inches back on body, sub in pink, reknit and bind off. Rip back on first sleeve, sub in pink, reknit and bind off. And that gets you to where I am right now. Half a sleeve left to knit and I'll be finished. Just in time for warmer weather and no need for sweaters. The silly part is that I've been working really hard to lose some weight and by next year, this sweater is going to be too big. Turns out the 4 balls of Hempwol would have done the trick, but then that wouldn't have been any fun, right? I love the addition of the pink hems. It was snowing here yesterday so I wouldn't assume that it'll be too warm to wear this once it's finished. And then next winter you can just send it to me. mwah! Hello Caro, the jersey is beautiful.I like to know since to beams the neck to me. You have begun the jersey by the neck? I did top down but the neck is not equal, is closed more. My english is not good, I hope that you understand to me. I take to long time visiting your blog. it's a gorgeous sweater, and your post is hilarious. i do hope you'll get some wear out of it, though, as frogging the entire sweater does not sound very enjoyable! Oh, no! It is a lovely sweater and the colors are so fantastic together. I've often put off knitting things in an effort to make them when I am a smaller size. Make an effort to wear it a few times before the true spring arrives because in New England, you can get snow in May. You know, if you can't wear it next year b/c you lose weight, that's not such a bad fate! Annoying yes, but not the worst thing that could happen! Beautiful sweater. Love the style. I also have the same strangulation fears! Love that pink hem even if it was a pita. Your knitting amazes me. That you can willingly pull out so much and do it again amazes me even more. The pink is a great addition, though - it looks lovely! Your story is so funny, after all that's happening. It's great that you are working hard in losing weight. At least if the sweater is too big next winter, it will be nice and roomy, but probably not as large as hubby's sweater, right? I love your expression in that picture! I have had that experience more than once, which is why I now always buy way to much yarn for my projects and invariably have two or more balls left over when I'm done. Next winter, when it's too big, you can rip it again and reknit it. Just think how economical you're being! Three sweaters from four balls of yarn! Looking hot, Caro! I so totally feel your pain on the NEVERENDING SWEATER KNITTING OBSTACLE thing. If I hit one more snag in this seamless sweater for Bubba, I'm gonna freakin' snap. Meanwhile, I'll be excited to see your final fabulous product!